Since 1966. We’ve provided wide selection from domestic high quality glasses to fun eyewear from Europe. 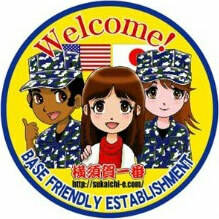 YOKOSUKA INFORMATION “YOKOSUKA 1CHIBAN” is a web site for foreign customers that introduces restaurants and other shops in Yokosuka, and it is cooperated with City of Yokosuka, Fleet Activities Yokosuka and The Yokosuka Chamber of Commerce & Industry.